Metroid, but arguably even better! DSiWare gets another massive load of new games today, but they're probably not the things you'll mostly be wanting to pay attention to - Both WiiWare and the Virtual Console only get one game each, but they're both great and more than worthy of a look-see. Jett Rocket (1000pts - Shin'en Multimedia) -- A 3D platformer with incredible graphics - If you didn't know better you'd think it was a retail game. Based mostly around the use of a jetpack and a hoverboard, it's a ton of fun and more than worth the price, as our review which will soon be up will tell you. 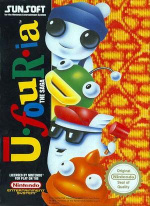 Ufouria: The Saga (500pts - Sunsoft) -- A very Metroid-esque game starring Sunsoft's original mascot, Hebereke, who was strangely renamed Bop-Louie and given a small makeover. Instead of only being reliant on new abilities you must find, you must also rescue three of your friends who have become trapped in certain places. You can freely swap between each of them once they've been found, and each has their own special abilities. It's an incredibly rare and sought-after game, so this Virtual Console release is a godsend for those who have longed to play it! We'll have a review available soon. Maestro! Green Groove (500pts - Neko Entertainment) -- Part of a previous retail release, now in downloadable form. The retail game was surprisingly great, which was probably the reason Neko Entertainment decided to release this. Of course, it's still great as a partial download, in fact, it's one of the best DSiWare games available. Read our Maestro! Green Groove review to find out why exactly. Prehistorik Man (800pts - Interplay) -- Practically a Virtual Console title, this is an "enhanced" port of the game Prehistorik Man, which has previously been released on the SNES and GBA, among other platforms. Enhanced is the completely wrong descriptor, though, because there's numerable issues like slowdown and poor hit detection that make it a better idea to just search for one of the older versions if you want to play it. Read our Prehistorik Man review to find out why else you should do this. Extreme Hangman (200pts - Gamelion Studios) -- This is basically just hangman with a few amusing animated stickmen thrown in for good measure. Fun for a while, but not really that different from the standard variant. Read our Extreme Hangman review for the lowdown. Ball Fighter (500pts - Teyon) -- Another puzzle game, this one requires you to grab balls (We know, we know) and place them elsewhere on the playing field in order to make the rest of them disappear. There's quite a few modes and the game is pretty decent, so for 500 points this isn't too bad a deal. Read our Ball Fighter review to find out more. Puffins: Let's Fish! (500pts - Other Ocean Interactive) -- A bit better than the previous Puffins title, this one has you swimming around underwater trying to catch fish. There's not much more to say, really, read our Puffins: Let's Fish! review! Only one truly "new" game, so you can already see if any of the DSiWare releases catch your fancy. Will you be getting anything? I'll definetley get jett rocket and I might get ufouria. OMG OMG OMG Europe is sooo lucky!!! They get one WiiWare game and Listen to this!!! Not zero - but ONE Virtual Console game!!!! 1 + 1 = A whole bunch of awesomeness!!!!!!!! And the DSiWare games??? OMG don't even get me started on all of the must have's on DSiWare!!!! Mega Man 5, Splatterhouse 3, Yoshi's Island and Castlevania Bloodlines please! Awww. Ufouria: The Saga looks cute. Never heard of Ufouria, but it looks pretty fun. That Ufouria game sounds really good actually. Hadn't heard of it until now, I'll try and get some more Nintendo Points soon. I'm also interested in that Ufouria game and will probably get it once it's released over here. Just downloaded Jett Rocket and really curious about Ufouria, but I think I need a review for that one. Sounds great though. Jett Rocket needs a review! Great update. Will buy Jett and Ufouria tonight! I'm thinking it could be a while before America gets U-four-ia. 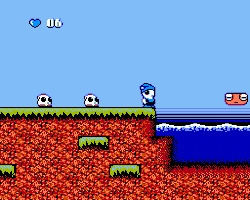 I also wonder if we will be getting Hebereke's Popoitto on the SNES which wasn't released in America either. Jett Rocket FTW! Insta-download... As soon as I get some points, which'll be on Monday. Gah, too much DSiWare rubbish! Give me more VC! Barioth demands it! I know this might sound wierd but I think I've seen those Ufouria characters before - on a level in Lemmings on the Megadrive ... might be wrong, was like 15 years ago, but that's what they remind me of. ONM doesn't think too much of U-four-ia. Ufouria: The Saga is the next game to given a new lease of life on Virtual Console. Ufouria? U what, more like. You take control of a character called Bop-Louie tasked with finding a bunch of amnesiac friends. Naturally, they've fallen into a ruddy great crater, rather complicating things. It sounds like a failed episode of the Mighty Boosh, and despite its unhinged take on NES platforming back in 1992, it left most of us utterly unmoved on its release. We're all for quirky, leftfield Virtual Console releases, but this might be a little too soft-boiled for some. Or in other words, its not a big name game so its probably going to be lame so we won't give it a chance. Personally, I think I'll probably be downloading U-four-ia as soon as I get some more points. I've heard of Ufouria before. The music and graphics are great! I wonder if there's a small chance this game might hit the States? Looking forward to the Jett Rocket review as I'm not completely convinced yet. I'm guessing an 8. Mmm, hopefully we get Uforia released over here even if it means paying the 100 points import fee. Seems like a fun game and no translation is needed. Ufouria? Awesometastic - now why did I get an import Wii again? Other than the VC release, this is catch-up week for PAL regions as all of the WiiWare and DSiWare games are already out in North America. Why is Ufouria that good? Comments anyone? ufouria is a great game!! !